A personalized, DIY gift can mean so much to your family! The best part is, I think we’ve found a little something for everyone! 1. 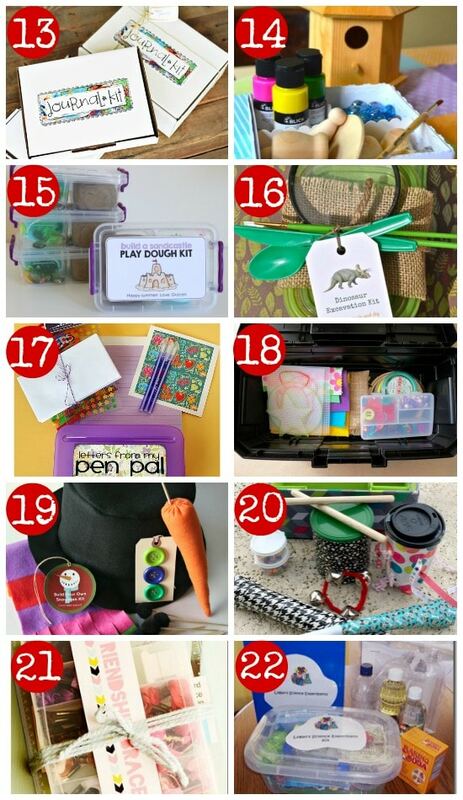 Sensory Play Kit- This DIY gift is so colorful and full of creative potential. 2. Lego Kit – Portable Lego gift with 24 free printable activity cards. 3. Sock Puppet Kit – Kids get to have a great time being creative and at the end there’s a puppet show. Win-Win Here! 4. 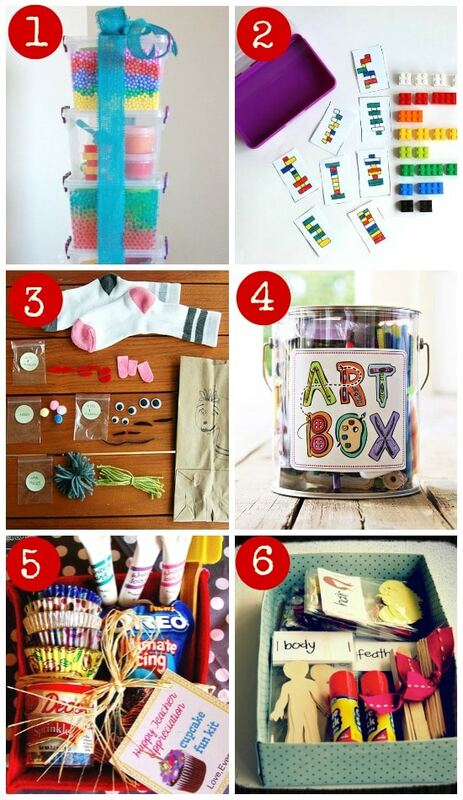 Art in a Box Kit – A box/can filled to the top with art supplies, craft supplies and things to get creative. Plus free printables and instruction for an artist’s apron. 5. Cupcake Decorating Kit – This gift is perfect for Christmas, a birthday, or a fun sleepover. Everything they’ll need for a sweet treat! 6. Paper Doll Kit– Mix and match colors, patterns, and buttons to make this simple paper doll DIY gift. 7. 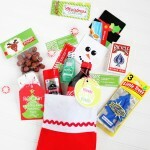 Caron Roll-Up Art Kit – This simple, easy, and inexpensive gift idea is perfect for on-the-go kids. 8. Finger Puppet’s Kit– Free printable puppet gift box, material list and instructions make this DIY gift easy and cute. 9. Gardening Kit– Kids can dig in the dirt and watch things grow no matter the season. 10. 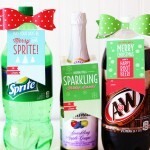 Giant Bubble Kit – A great DIY gift idea with bubble recipe, how-to instructions and free printable labels. 11. Super Craft Kit – Fill a tackle box with all the artsy crafty stuff a little girl could ask for. 12. Stick Puppet Kit–This puppet kit is a great way to use up left over craft supplies creating a perfect DIY kid gift. 13. Journal Kit –This kit comes with a free printable for labeling the box and all of its content. 14. Fairy House Kit – Put together this super-quick, CUTE, tiny, fairy house building kit with left over craft supplies. 15. Sand Castle Kit– This includes instructions for sand play dough and a simple material list to create a fun kid gift. 16. Dinosaur Dig Kit –If you have a budding paleontologist in your house, here is the perfect gift. 17. Pen Pal Kit – Gather a pencil box, paper, pens, envelopes, and maybe a treat and you’re good to go on this DIY kid gift. 18. 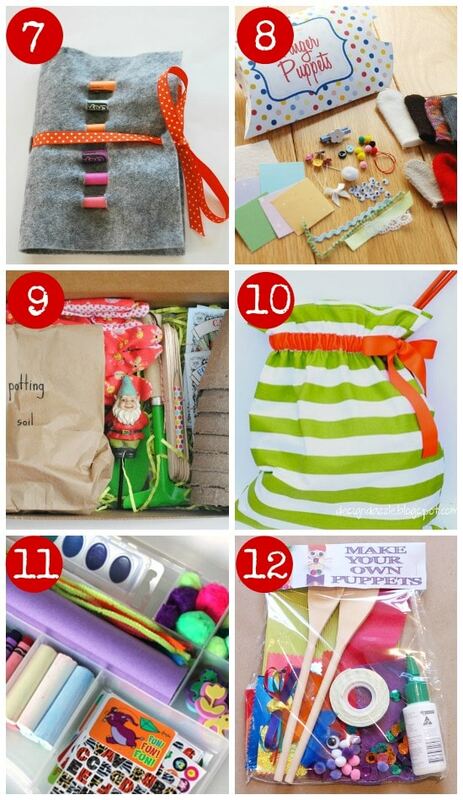 Beginner Sewing Kits – Here is a simple idea for kids who enjoy beginning sewing projects. 19. Snowman Kit – Pair this cute DIY gift with a free printable and you’re in business. 20. 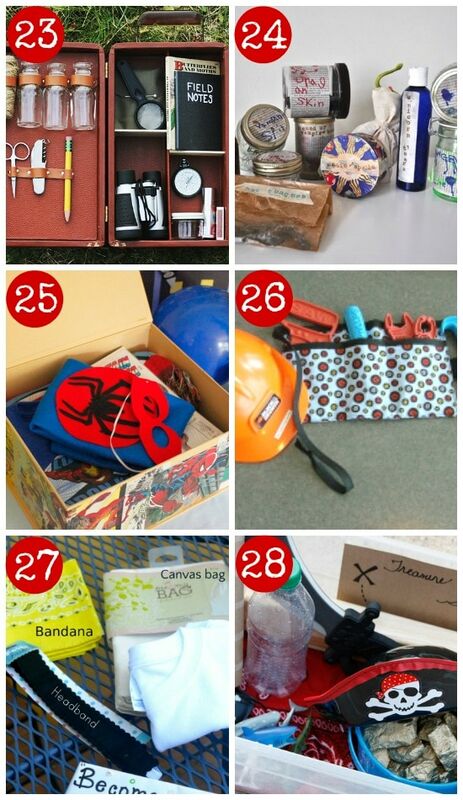 Band in a Box Kit – This DIY kit is made completely from recycled materials. Save your peanut butter jar for the BAND. 21. Friendship Bracelet Kit – To make this easy gift kit you just need to head over to your local craft store. It also comes with a free printable. 22. Science Experiment Kit – Includes a list of experiments to try and a material list. This is such a cool gift for kids. All of these kits are exploding with hours creative playtime fun! 23. Explore Kit – Give it to a little explorer and set them free! 24. Magic Potion Kit – Your child will create mixers never before seen by any man. Plus it’s made from non-toxic and easy to clean up materials. 25. Super Hero Kit –If you have a Superhero-obsessed little boy (or girl) then your child needs a Superhero Kit complete with everything he or she requires to be ready for some action! 26. Construction Working Kit –It’s tough work being handy. How about making it easier on the little guys and putting all of their tools into a tool belt…perfectly sized for them. 27. Fashion Designer Kit –A great collection of material to create some fun fashion pieces. Your living room will transform into a runway! 28. 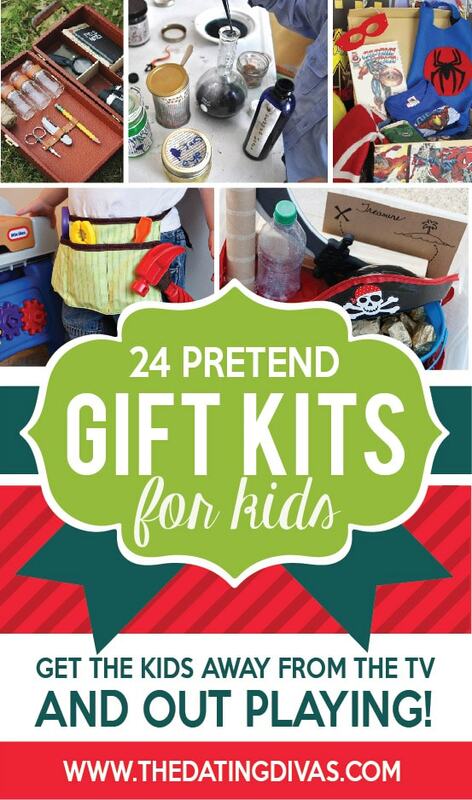 Pirate Play Kit – A play box filled with imagination and pirate activities. It’ll be enough t’keep them scallywags busy day and night. 29. Secret Agent Kit – This kit can function more like a mystery game or a solve-the-crime kit. Such a great gift idea! 30. Mustache Disguise Kit – With a little felt, elastic and a few other fabrics, these are super easy to make. 31. Doctor Kit – Is there a doctor in the house? 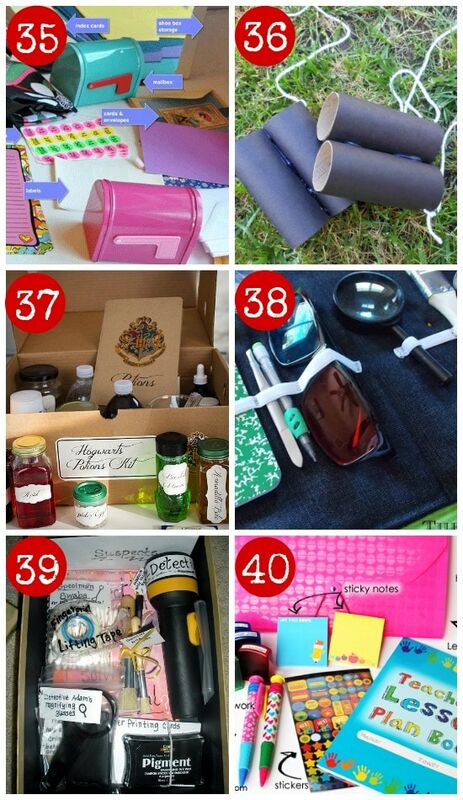 There could be with this creative DIY gift. 32. 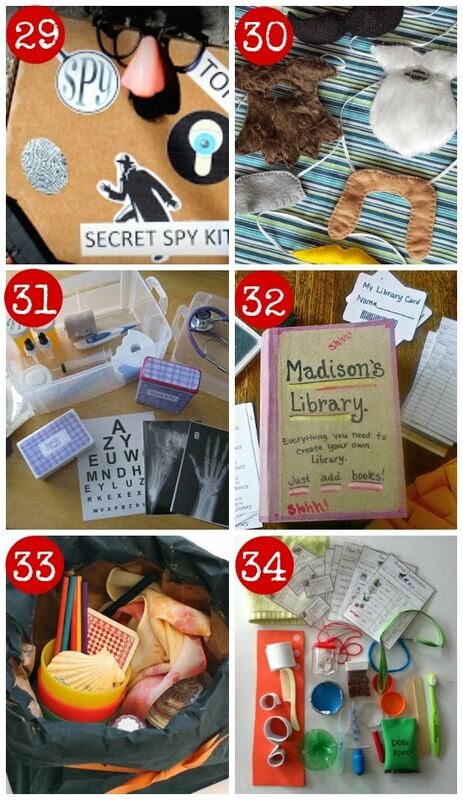 Library Play Kit – Let your child turn your book collection into an “at home” library. 33. Magic Kit – A simple homemade magic kit made from basic household items provide kids with hours of endless creative play! 34. Veterinarian Kit – My boys don’t have a pet, so they pretend their stuffed animals are alive. They would love this DIY play kit to take care of their stuffed friends. 35. Post Office Play Kit – My kids love to get mail and with this cute play kit, they can give everyone in the house some mail. 36. Back Yard Explorer – There’s no reason awesome gift ideas have to stay inside! Here is a simple and inexpensive DIY kid gift to give your child some outdoor fun! 37. Hogwarts’ Potions Kit – This Harry Potter-themed gift is perfect for spells and potions class. There are instructions for a DIY wand and a spell book! 38. Spy Kit- Here is a cute DIY spy carrying case with dollar store equipment. 39. Detective Kit – No mystery is too great when you’ve got your detective kit on hand! 40. Play Teacher Kit – Bust out the paper and pencils, because it’s time for school! Learning is even more fun when you’re the teacher! 41. 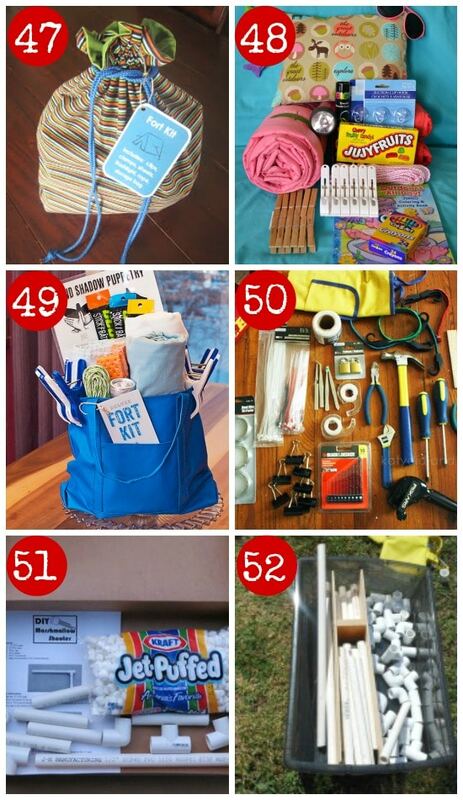 Mail Carrier Kit – This is a craft for the sewing moms out there. This is a darling little DIY gift with great instructions for every item. Time to bust out the sewing machine! 42. Kid’s Pack & Play Stove Kit –This is the cutest little stove and it’s small enough to pack around and go into the car. Have stove, will travel! 43. Pirate Costume Kit – Embrace your inner Pirate, (ARGGHH!) and make a very simple pirate costume that works great for playtime around the house or for a themed birthday party. Really great instructions! 44. Dress up KIT – My kids LOVE to dress up! This is a great start for collecting all of the things you need to have an excellent costume box! 45. Fireman Costume Kit – Making a fireman’s air tank out of recycled materials is inexpensive and a fun addition to a child’s dress-up collection! 46. Baker’s Kit –Assemble some baking equipment and supplies to make the perfect DIY gift for a junior master chef! 47. Fort Kit for Girls – What a cute DIY gift for any girl. If I had a fort like this, I would never come out! 48. Fort Kit for Boys – Homemade gifts really are the best. This is a great gift that can be personalized for your little guy, with sewing instructions. 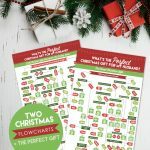 Plus, it comes with free printable labels for each idea in the Kit! 49. Shadow Puppet Fort Kit – This kit it great for forts and great for shadow puppets! It comes with a free printable tag and a Hand Shadow puppet cheat sheet! 50. 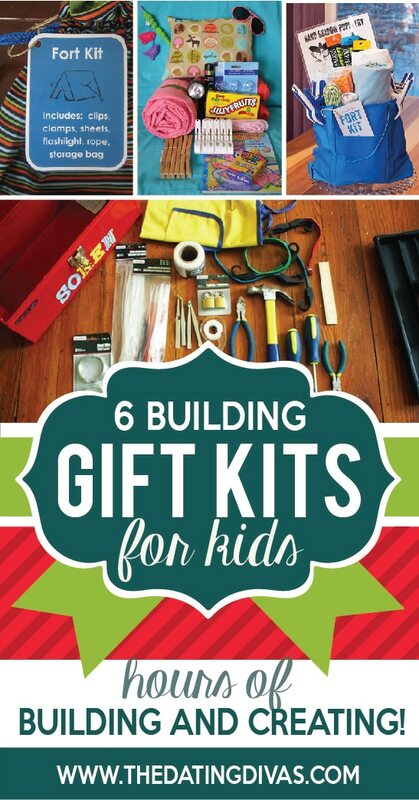 Kid’s Tinkering Kit – This gift is sure to bring out the builder in your child, a tinker kit made of real tools! It’s time to take things apart and rethink the world. 51. Marshmallow Shooter Kit – This is a great gift without spending a lot of money. Plus, it comes with free printable labs and instructions to go in and on the box! 52. PVC Building Kit – This is a great gift idea for the little builder in your life. You’ll have a little construction site in your backyard! 1. School Emergency Kit –This is the cutest emergency clutch! (cute potholder turned emergency wallet.) It’s perfect for your car or purse or boat or camper…..
2. Camping Survival Kit – This is a great kit for any adventure seeking camper or fancy it up for some “glamping”. This gift is compiled of things totally from the dollar store. 3. Sleepover Kit –A sleepover in a bag! All the stuff to make any sleepover a HIT! This makes me wish I was 16 again. So FUN! 5. 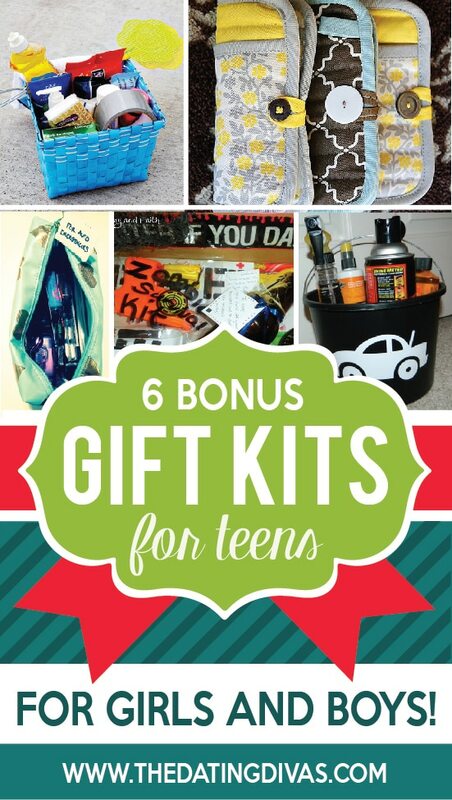 New Driver Kit for Boys–Give your new driver some fun (and safe) car gifts for this milestone year. 6. Zombie Survival Kit–If you’ve got a boy that LOVES zombies, then here is a gift he’ll love! It has an easy to follow picture guide to get just the right look. Aren’t these ideas FUN? 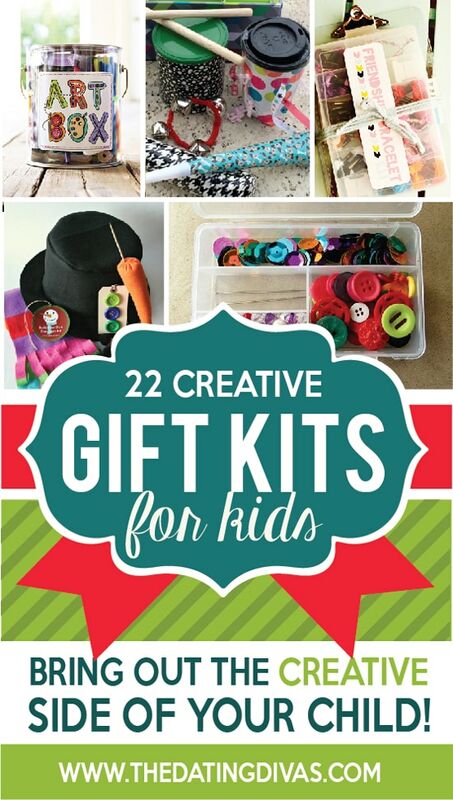 With this collection you’re sure to find the perfect DIY gift for you little ones! Now that you’ve got the kids covered, need some gift ideas for the husband? Take a look at Christmas Gifts for Him or Romantic Gift Ideas for your Husband. Happy Gifting!! By the way- If making gifts is not really your style, here are a few Gift Kits ready at the click of a button: Dr. Doctor , Undercover Spy Case Detective , and Art Case with Easel . Aren't these ideas FUN? 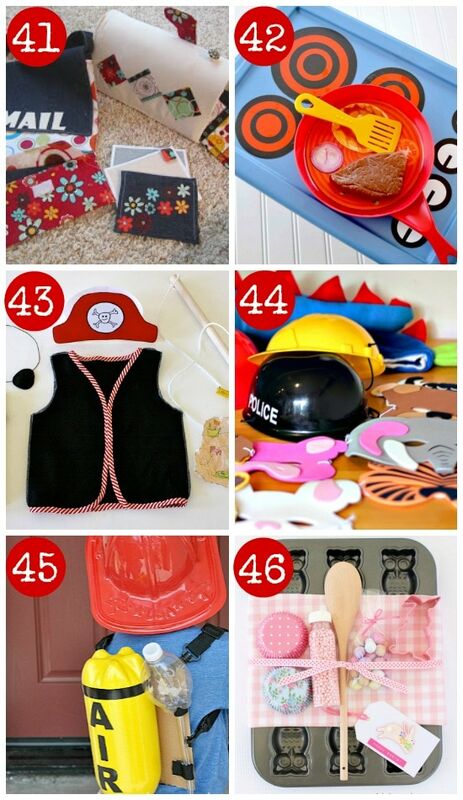 With this collection you're sure to find the perfect DIY gift for you little ones! Now that you've got the kids covered, need some gift ideas for the husband? Take a look at Christmas Gifts for Himor Romantic Gift Ideas for Your Husband. Happy Gifting!! Handmade gifts are the BEST! Thanks for putting together such an awesome list, Amanda!! Lear- You’re totally right! I’m a fan myself! Thanks!! I’ve got some of these gifts under the tree this year! This is a great collection of ideas, Amanda! I am totally using some for Christmas this year! Thanks so much! Thank you for sharing my Giant Bubbles Tutorial. It’s super fun and super BIG! Thanks for featuring my Giant Bubbles Tutorial. It’s super fun and super BIG bubbles. I just wanted to say thank you so much for featuring our Spy Kit and Mustache Disguise kit! 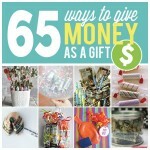 Such a great collection of gift ideas! I totally didn’t know the zombie kit I made my boyfriend got on your list! That’s so cool! 😀 Thanks! 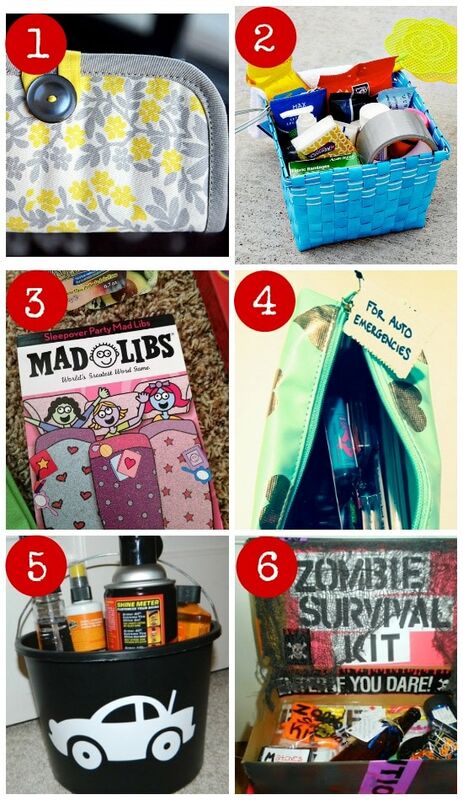 I totally didn’t know that the zombie kit I made my boyfriend got on your list! So cool! 😀 Thanks!